Mall Closed In Observance of Holidays: Easter Sunday, Memorial Day, 4th July, Labor Day, Thanksgiving Day, Christmas Day and New Years Day. Chessie's Restaurant join us for lunch or dinner with our extensive and award winning menu. Dine in our authentic 1920's Illinois Train car or in our full "pub" bar. Our atrium isopen and airy. Host or cater your next event with us from banquets, meetings or a special occasion event, we have a variety of venues to serve your needs. Flesk Brewing owners, William and James’s tap room will feature their many home brewed beers at their new location in the Ice House Mall to include, Ghost Relic, Moped Traveler, Chocolate Factory, Into the Void, Occam’s Razor, Imperial Running Man, Coat of Arms, Mister Fancy Pants to name a few. Flesk will also feature live music and William and James’s favorite board and card games for patrons to enjoy while visiting Flesk Brewing. New Location, New Look, New Savvy! Find clothing and accessories that are as unique as you at Savvy Spirit. 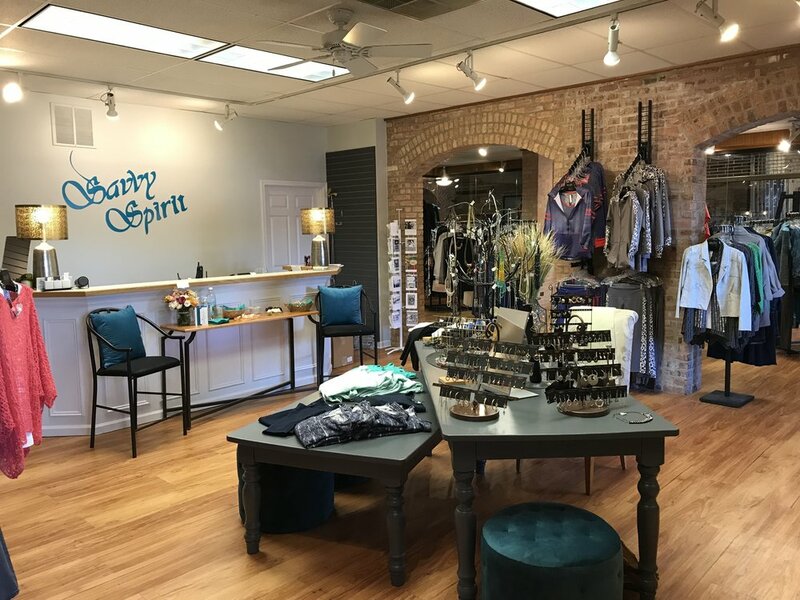 Our boutique features fun, casual clothing and accessories that will set you apart from the rest and allow you to create your own style and look. We are always happy to assist in you! Plan a private party at Savvy. Call for details. Founded by two extraordinary women, EWELINEB Fashion, offers three main fashion clothing lines: day, cocktail and occasions, which are released every season. Additionally, we release Limited Edition Collections twice a year. All creations are unique and meticulously made, designed and made from the beginning till the end in our studio. Each piece is done with utmost care for detail and predominantly made from natural fabrics such as silk, wool, cotton and linen, which are of the highest quality. Our assets are creativity, attention to details and perfect sewing. 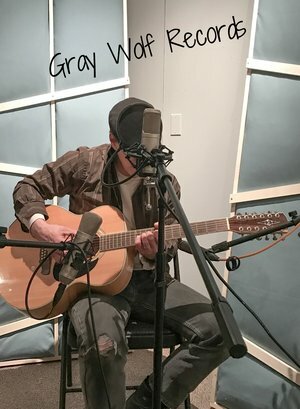 Gray Wolf Records is a record label and music/audio production company for local, national, and international musicians, businesses, poets, and artists looking to develop and expand. Productions and consultations for music, radio, YouTube, television, and podcasts. Clients include some of Chicago's top artists. The Sanctuary Salon and Spa staff's mission is to provide personalized customer service to their clients. Our salon offers hair services, from specialized haircuts, to coloring, retexturizing and Keratin treatments. Our nail area services include manicures, pedicures and no chip shellac polish. Spa services include facials, relaxing treatment, waxing, eyebrow and eyelash tinting and microblading are available. Since 1968, Travel House has helped residents of Barrington and Chicagoland area design travel experiences with outstanding quality and value. For fourteen years running, Travel House has made Conde Nast’s list of the top 100 travel agencies in the country. Whether you want to see the Seychelles, check out the cherry blossoms in Japan, or take the family to Disney, the expert Travel Consultants at Travel House will help you plan the perfect trip, your dream vacation, or business trip. Are you curious to know the value of a rare coin, currency or stamp collection that you inherited from your grandfather? Call Dubin Rarities in Barrington, IL for a free verbal appraisal of your collection. We have been buying, and appraising coins, currencies, precious metals and jewelry for more than 35 years. 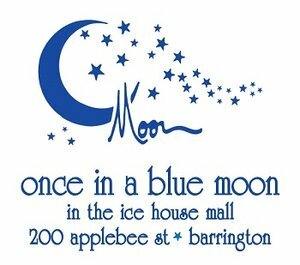 Owner Bob Moon has been providing customers with a unique store with mostly handmade jewelry in sterling silver and karat gold since 1980. once in a blue moon features the works of ten different artists. once in a blue moon offers to its customers creative ideas and repair service with your jewelry. Paris Market Antiques has a fabulous selection of European style Antique Décor a well as Antique garden iron, garden cement to French Armoires. Paris Market Antiuqes offers a variety of Victorian, Deco, Early American and English selections of antique furniture, silver, crystal and china. There is something for everyone and every preference of style! Barrington Fine Rug Gallery - Now Open! Our business is selling fine and antique carpets at affordable prices and providing cleaning and restoration services. Our goal is to expand the appreciation of fine and antique oriental rugs and to share our knowledge, experience, and love of these beautiful pieces with clients looking to acquire and incorporate these special items in their home and office. Over the past half a century, we have assembled a collection of true pieces of art, unique in every aspect including overall design, materials used, age and condition. Come on in and explore our range with absolutely no obligation - we enjoy talking rugs and sharing our passion! "Premier Tutoring and College Preparation Services"
"Laura George Consulting, LLC offers customized, one-on-one ACT, SAT, and executive functioning tutoring programs, college essay development coaching, and comprehensive college application assistance. Our goal is to empower students to achieve acceptance to their ideal colleges."